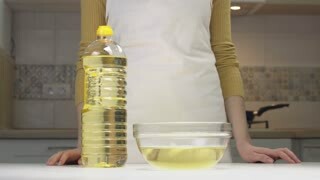 Search Results for "oiled woman"
Funny young blonde man who is being oiled with a moisturizer cream by his girlfriend. Man is looking relaxed and calm. Man and woman are talking and smiling. Massage session. The masseur rubbing the skin with oiled hands. Tattoo on the back. Top angle. Close-up scene of a blonde man who is being oiled with a moisturizer cream by his girlfriend. Man is looking relaxed and calm. Close-up scene of a blonde cute man who is being oiled with a moisturizer cream by his girlfriend. Couple is talking and smiling. Close-up scene of a blonde charming man who is being oiled with a moisturizer cream by his girlfriend. Couple is talking and smiling. Close up of hands doing massage with oil on woman back in spa salon. 1960s: Chemistry lab, samples of rancid and non-rancid oil, woman in white coat works at bench full of glassware. Woman removes flask tops, uses eyedropper to transfer liquid.